The last parts of this print came together quickly. The climbers, who were the first characters I knew I wanted to include in this print, were printed in two stages. Then I added a map of Coronado's journey and some of the tribes in the area, and finished it off with some rubber-stamped lettering for a few towns and pueblos that Coronado visited. Based on a satellite view of Nogales, USA and Nogales, Sonora, Mexico. I used several different styles in rendering the various figures because I wanted it to look like a collage, the elements sort of cobbled together from different time periods and different worlds. As usual, I learned a lot about the topic as I worked, but in this case what I mostly learned was how complicated the issues around this border really are. It would have been easy to take an extreme point of view -- immigration is bad, or the Dept. of Homeland Security is bad, or the world is ending -- but my feelings ended up more complicated than that. Everyone is just doing their job, playing their part. The border guards are doing their job protecting American citizens from drug dealers, smugglers, terrorists and illegal immigrants, and the immigrants are doing their job hoping to make a better life for themselves and their families. Isn't that what has always drawn people to the U.S.? Isn't that hope for a better life the American promise, the American dream? What else but sheer desperate hope could make a person risk their life crossing a desert for a job? I don't think the fence will stop people from coming into the U.S. via our southern border. I don't think there's any way to stop this flow. People migrate. People have always migrated. It's said that the native American tribes migrated to North America from Asia over the Bering Straits. Maybe those first Americans would have fared better if they had built fences when the Europeans started showing up, but I doubt it. People migrate. Rather than asking "How can we stop illegal immigration?" perhaps our policy makers should try a different question, like "How can we help our southern neighbors better support their own people?" or "How can we share our American dream while keeping our society safe and stable?". I fear that as our climate goes through the upheavals that are predicted, we'll see global migration on an unimaginable scale. The underlying question every society seems to be grappling with right now is just this: Who is "us"? In my research for this print I was surprised to find out that the first patrols along the U.S./Mexico border in the early 1900s began largely in an effort to apprehend illegal Chinese immigrants, not Mexicans. In 1882, Congress had passed the Chinese Exclusion Act in reaction to the large numbers of Chinese who had come to the American west to participate in the gold rush or to take jobs building the railroads. The Chinese Exclusion Act act provided a moratorium on Chinese labor immigration, required any Chinese who left the United States to obtain certificates for reentry, and made Chinese immigrants permanent aliens by excluding them from U.S. citizenship. The Chinese Exclusion Act was the first significant restriction on free immigration in U.S. history and the first time a law was aimed at one specific ethnic group. The act wasn't repealed until 1943, which I notice was a year after the internment of Japanese in America began. America may pride herself on being a nation of immigrants, but every new wave of people seems to suffer discrimination. Since 2003, the Border Patrol (officially established in 1924) has been part of the Department of Homeland Security, part of a new agency called U.S. Customs and Border Protection (CBP). The priority mission of the Border Patrol, as a result of the 9/11 attacks and its merging into the Department of Homeland Security (DHS) is to prevent terrorists and terrorist weapons from entering the United States of America. However, the Border Patrol's traditional mission also remains: the deterrence, detection and apprehension of illegal immigrants and individuals involved in the illegal drug trade. I used this small brush, called a hanga bake (McClain's calls it a tebake), which is good for applying pigments to small areas. The block is inked here for the first skin tone. Inking the block for some hair. In April of this year, the Department of Homeland Security announced that it will waive federal environmental laws to meet the goal of finishing 670 miles of border fence by the end of 2008. The waiver, which will allow the department to slash through a thicket of environmental and cultural laws, would be the most expansive to date, encompassing land in California, New Mexico, Arizona and Texas that stretches about 470 miles. The waivers are highly controversial with environmentalists and border communities, which see them as a federal imposition that could damage the land and disrupt wildlife. The 2,000-mile long U.S./Mexico border region is considered an extraordinary source of biological diversity -- deserts, mangrove forests, plains, mountains, river valleys, and wetlands. Environmental groups say that the border fence will bring disaster for the biological diversity of the region by restricting the movement of wildlife and disturbing the unique and fragile ecology of the region. The border area is home to many endangered species of plants, birds and animals, such as owls, parrots, jaguars, wolves, bears, and lions, that often need to move around as an essential element of their survival. One species that particularly caught my attention is the Jaguarundi, a not-often seen cat that is found in Mexico and the southwestern U.S., so I decided to include a jagarundi in this print. I've lived in Massachusetts most of my adult life, but from 1992-1995 Lynn and I lived in Taos, New Mexico, a place I had visited often and fallen in love with. Before we moved there I knew that Taoseños divide the town's population into three basic ethnic groups -- Indians, Spanish and Anglos -- but what I didn't know until I moved there was that the Spanish families of Taos have roots going back farther in time than any of the "brahmins" of Boston. The first Spanish arrived in Taos in 1540, eighty years before the Mayflower Pilgrims stepped on their famous rock, when Capitan Hernando Alvarado came north from Mexico as part of the expedition of Francisco Vasquez de Coronado. From then on, except for a 16 year period after the 1680 pueblo revolt which led to the expulsion of the Spanish from New Mexico for a time, Taos was colonized by Spanish families, many of whom still live there. At the time of the American Declaration of Independence, the Taos Valley area contained 67 families with 306 Spaniards. Both the Spanish and the Pueblo Indians of Taos have long deep roots in the land there, and one of the most common questions I was asked by people from both populations was "Why aren't you with your people?" By the time I had lived in Taos for 3 years, that question had done its work, and I came back east to be nearer to "my people." Here in the American east, this early exploration and colonization of the United States by Francisco Vasquez de Coronado and other Conquistadors is largely unmentioned and ignored, but in both Mexico and the U.S. Southwest, Coronado is a well-remembered figure. There are Coronado high schools, Coronado Parks, Coronado highways, Coronado bridges, towns and islands called Coronado, and Coronado monuments scattered from Kansas to California to Mexico City. I wanted to include Coronado in this print, so I carved a block modeled on Frederick Remington's famous painting of Coronado setting out on his journey. Here's the print after an impression I took tonight from the second block. Carving topographical features like this takes forever, but it's these very features that give the map prints their veracity as maps so I can't forgo these details. I love how this layer gives the print so much depth. Next I'll be starting carving on a third block and adding some human characters to the scene. After the gloss medium and carborundum dried, I taped the acrylic acetate to the woodblock so I could use the block's kento, then painted pigment onto the carborundum drawings with a regular watercolor brush. After experimenting to find just the right amount of pigment that needed to be applied, I got a nice indistinct print that looks something like sandstone. I don't often use my plastic "disk baren", a non-traditional baren designed by the famous Japanese printmaker, Akira Kurosaki, as I most often want the strong pressure that I get from my ball bearing baren. 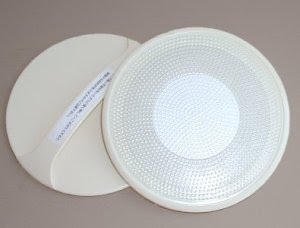 The disk baren has tiny bumps on the surface that make an even but fairly light impression, especially when compared to the ball-bearing baren. But for this print I expect that there will be a lot of layers, so I want to build the color slowly. I've found myself preferring the disk baren for its light touch. 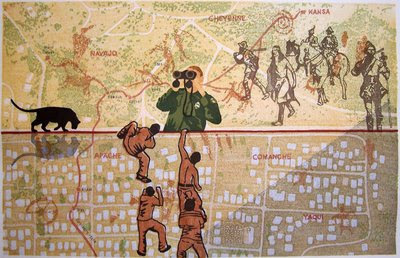 Here's the block and print that begins to define the outlines of buildings in present-day Nogales.